One of the main problems with buying designer clothing off of eBay and other auction sites is that there is really no guarantee that the item you are purchasing is actually what it appears to be. Despite a crackdown by eBay on counterfeit designer goods, the site still has a problem with fakes (though eBay will refund you if an item is fake). 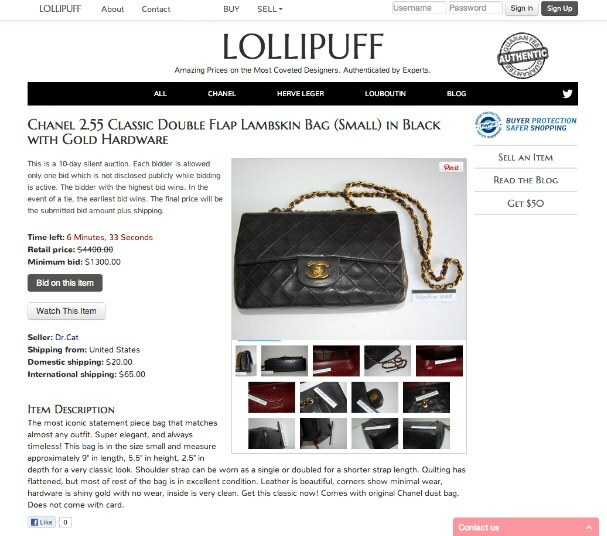 YC-backed Lollipuff is an auction site that fully authenticates any designer clothing and accessories it sells. On Lollipuff, the founders employ a combination of human expert authenticators with a patent-pending process to ensure that the goods on the site are real. For now, Lollipuff focuses on three of the most designer brands on auction sites: Chanel bags, Christian Louboutin shoes, and Herve Leger dresses. When a seller applies to sell on the site, the startup asks for specific photos that will be able to show whether a dress, bag or pair of shoes is a fake. All the items sold are either lightly used or brand new. Often times, scammers will upload fake pictures to their eBay listings, so that buyers will believe that what they are purchasing is the real deal. But on Lollipuff all pictures have a specialized code number that ensures that seller took the photos themselves. The startup also asks for specific, detailed photos that would not be able to be found on a fake bag. Lollipuff takes around 7 percent of every transaction. Lollipuff launched in December in beta and with no marketing, is now seeing over $15,000 worth of clothing and accessories sold every month. The idea for Lollipuff grew out of founder Fei Deyle’s fashion blog where she would write guides about avoiding counterfeit items, and the industry in general. Many consignment stores started coming to her to authenticate resale items, and readers began to ask to purchase and sell the clothes she was blogging about on her site. The idea to provide an authenticated site for designer goods was born. The market for designer goods amounts to around $50 billion in the U.S. Many brands like Chanel and Christian Louboutin hold their value extremely well, making the resale market also significant. In fact, some designer goods actually appreciate. For example, Chanel bags have historically gained about 20 percent in value annually. And despite the efforts made by eBay to crack down on counterfeit items being listed, it still does happen. Deyle says she recently saw a fake Chanel bag selling for $2,900, and still had a day left for bidding. The startup’s other founders include Travis Deyle, who holds a PhD in Robotics from Georgia Tech, and David Mohs, a former software engineer at Google. Fei says that she and her co-founders will soon expand to verifying and selling other designer goods.